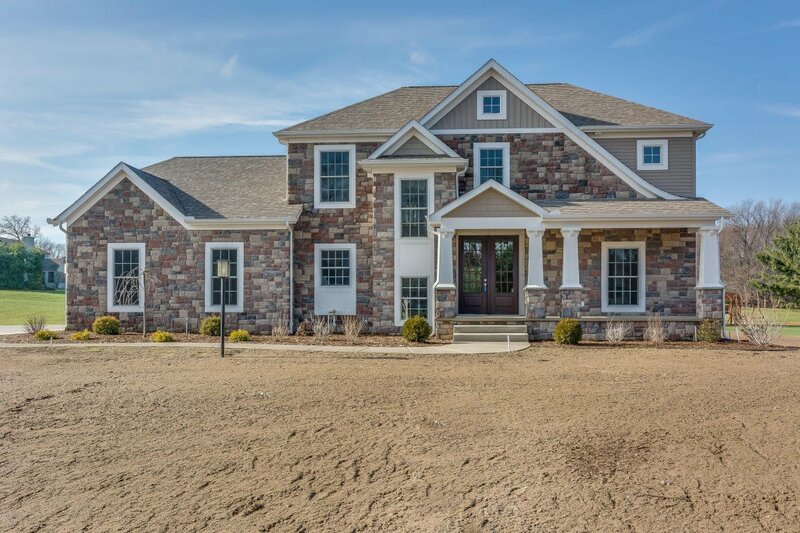 This beautiful new home by Century Builders in Kestrel Hills offers over 4,000 SF of living area with 5 bedrooms and 4 bathrooms. Kestrel Hills is located just over the Michigan state line just north of Granger and about ten minutes from Notre Dame. The main floor of the home features hand-scraped hickory flooring in the foyer, kitchen, pantry, dining room, great room, and office. The Great Room features a gas fireplace and archway which connects to the kitchen area, as well as to a versatile office/bedroom. The kitchen features granite counters, center island with sink, pantry, all stainless steel Frigidaire appliances, and Hancock cabinetry. The main level laundry room features built-in cubbies, Brookport cabinets, and ceramic tile flooring. There is also a full bath as well as a spacious sun room with access to a maintenance-free Fiberon deck and patio area. The upper level features 4 bedrooms and 2 full bathrooms. The Master Suite features a sitting area with private balcony, walk-in closet and bathroom with double sinks. All of the bedrooms offer plenty of closet space. The walk-out basement includes a large Rec Room with wet bar, as well as an additional bedroom and full bathroom. For full list of home features, see attached documents. Call to see this home today! Listing courtesy of Coldwell Banker The Real Estate Group. Selling Office: Cressy & Everett Real Estate.